Operating and maintaining a nuclear power plant, renewing the license of an older nuclear plant, or licensing, designing, and constructing a new nuclear plant – all are monumental efforts that few utilities are resourced to tackle entirely on their own. Most utilities need the engineering services, inspections, monitoring systems, analytical software, and industry-specific training that can only come from an engineering consulting firm that has grown with the nuclear industry. Structural Integrity has provided engineering services to both domestic and international nuclear plant operators since its inception in 1983. Since then, nearly every nuclear utility in the U.S. and many internationally have relied on our support. Whether primary system or balance-of-plant piping, above ground or below ground piping, safety-related or non-safety/B31.1 piping, and no matter what the material or damage mechanism, Structural Integrity can assist. Our earliest experiences include Alloy 600 weld material evaluations and repairs as well as software for the monitoring and life management of piping fatigue. Structural Integrity can assist whether the need is ASME Code analysis of new or existing piping systems, pre-service or in-service inspection, or the characterization, assessment, and mitigation of existing damage. Our consultants play pivotal leadership roles in defining and quantifying the issues as well as the approaches to their resolution through our support of the ASME Code and EPRI. In turn, we work with utilities to apply these industry-vetted approaches to their plants. Examples of this include license renewal disposition of cast austenitic stainless-steel piping, inspection of high density polyethylene piping as new or replacement material for buried piping, and performance of leak-before-break analysis to justify absence of plant protective equipment and analysis to envelope catastrophic line breaks. Structural Integrity provides strategies, analysis and software for managing the aging effects of metal fatigue from cyclic thermal stresses. Informed by decades of experience, we pinpoint limiting locations in your plant and work with you to design practical strategies to manage metal fatigue throughout the life of your plant. As a leader in this area, we developed SI:FatigueProTM 4.0, an innovative software that provides ASME code fatigue environmentally-assisted fatigue and cycle monitoring using existing plant instrumentation. SI:FatigueProTM 4.0 and its preceding versions are used in more nuclear plants worldwide than any comparable system. Leaks in your plant’s buried piping are a serious concern – and the risks only grow as equipment ages. Structural Integrity’s multi-disciplined, turnkey offer for buried piping grew out of NEI 09-14 and is underpinned by our MAPProTM software, a risk quantification and data management/visualization tool, currently being used by over 50% of US nuclear plant sites. Whether your issues are related to cathodic protection, soils, coatings, piping stresses, or one of many forms of corrosion, we can assist. Our engineering and data management services are complemented by an array of inspection and monitoring services leveraging technologies such as guided wave, EMATs, and pulsed eddy current. Service water systems are large, with miles of piping and non-standard designs (by contrast with primary systems). Because service water systems, especially those that are safety related, are required to be diverse and redundant, they are subjected to a wide variety of operating conditions (e.g., intermittent flows, extended periods of stagnation) such that many systems spend most of their lives in wet lay-up that make water treatments difficult and corrosion problematic. Structural Integrity is highly adept at characterizing and evaluating degradation and damage to justify continued operation until mitigative measures or planned repairs can be implemented. Vibration-induced piping and equipment issues can be introduced by a variety of factors, including changes or unique events in system operation, new component additions and small-bore piping modifications. Most engineering change packages address standard loads (deadweight, thermal, seismic) and overlook vibration. In addition to design reviews, our vibration-related services include field instrumentation, data acquisition, analysis, and troubleshooting to resolve these often-complex problems the first time. Risk-informed programs use independent evaluations of failure consequence and failure probability to determine component risk, then reduce piping inspections in such a way as maintain and even decrease risk. 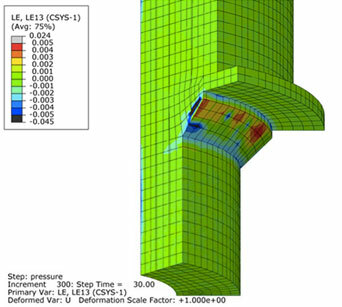 Structural Integrity played a key role in the development of the most widely-adopted risk-informed technologies for pressure-retaining piping welds, EPRI RI-ISI (ASME Code Cases N-560 and N-578) and RIS_B (ASME Code Case N-716-1). Moreover, we’ve implemented risk-informed programs based on these standards at a total of 45 nuclear plants world-wide. Structural Integrity offers an array of highly-advanced technologies to evaluate piping for variety of damage mechanisms; whether buried or above ground, or whether base material corrosion mapping or dissimilar welds inspections. Technologies employed by our trained and qualified NDE professionals include guided wave, linear phased array, TOFD, and dynamic pulsed eddy current. We also offer services employing our revolutionary new technology, LATITUDETM. Upon experiencing repeat failures of an RHR bypass line, Structural Integrity assisted a utility with evaluating the apparent cause. Metallurgical analysis categorized the failure(s) as high-cycle fatigue. Through specialized piping analysis and targeted data collection, we determined that the line had a resonant condition excited by vibration from the containment fans during specific lineups. Structural Integrity assisted the utility with designing and implementing a revised support configuration to mitigate the problem; no additional failures have been observed. Fermi has experienced internal corrosion in excess of design allowances on several safety-related systems, causing reduced structural margins at many locations. Structural Integrity developed a FOAK assessment approach to help Fermi reduce potential impacts on operations and avoid excessive costs due to unplanned repairs/replacements. A strategic on-line inspection program was developed based on piping risk metrics, which were computed as the product of likelihood of degradation and remaining structural margin. To assist in planning, the risk metrics by segment were illustrated in graphical, 3-D model. This tool simplified consideration of additional factors, such as LCO risk, dose impact, scaffolding requirements, and others, resulting in a targeted, plant- and system-specific risk evaluation that was used to optimize inspections. With the shift to encoded examinations for Dissimilar Metal Welds (DMWs), new challenges emerged due to restricted access or obstructions. Structural Integrity has helped numerous utilities meet those challenges by designing low-profile robotic equipment that eliminates or reduces the impact of these restrictions. Structural Integrity continued this innovations by designing a new manual encoding methodology called LATITUDE™. The system has been qualified for DMW examinations with a new procedure in accordance with EPRI's Performance Demonstration Initiative. The procedure has been further enhanced by including more probes and including a technique for robotic equipment when field conditions demand such. Structural Integrity has been intimately involved in vessel, vessel nozzles, and vessels internals issues over its 35-year history. Besides the BWR and PWR vessel themselves, our extensive experience includes pressurizers, steam generators, heat exchangers, and tanks. Our early history and success stemmed from BWR Inter-Granular Stress Corrosion Cracking (IGSCC) and the industry-wide Vessel Internals Program (BWR VIP). Since then, we've become a mainstay when it comes to vessel materials surveillance programs by generating and revising pressure-temperature curves and flaw handbooks, as well as supporting and defending embrittlement-related analyses and programs in license renewal applications to the Nuclear Regulatory Commission. More recently, we've been involved in PWR internals inspections per EPRI MRP-227. Besides active leadership in ASME Section XI requirements for primary system vessels, our staff has been instrumental in the development and application of ASME Section VIII for balance-of-plant vessels including heat exchangers. We've also provided sophisticated dynamic analysis of vessels and tanks to justify operability when subjected to seismic event (sloshing) and missile impacts. Radiation embrittlement is a known degradation mechanism in ferritic steels, and the beltline of reactor pressure vessels is particularly susceptible to radiation damage due to the high local fluence. The effects of radiation on vessel materials have impacted heatup/cooldown limits for PWRs, and increased hydrostatic test temperatures for BWRs, thereby significantly limiting plant operation. Structural Integrity, with strong expertise in managing reactor vessel integrity, provides nuclear plants with technical support in many areas including: pressure-temperature curve development; reviews of RPV materials surveillance programs; setpoint evaluations; pressurized thermal shock evaluations; vessel fluence evaluations; and evaluations of projected vessel properties. Structural Integrity was instrumental in the development and evolution of many of the BWR Vessel Internals Program (VIP) inspection and evaluation guidelines and their application to many US and international nuclear plants. This includes services ranging from preparing proactive/preparatory analyses to determine acceptable flaw sizes for internals inspection to performing emergent flaw evaluations to advise on run/repair/replacement decisions to supporting third-party reviews of repair/replacement activities. As structural margins decrease with aging, Structural Integrity employs increasingly more sophisticated analysis methods to reduce conservatism and gain margin. Concerns about aging degradation of PWR reactor pressure vessel internals have become a high priority as nuclear plants approach and enter license renewal periods. In response, the EPRI Materials Reliability Program (MRP) prepared inspection and evaluation guidelines for managing the effects of aging degradation in PWR internals that include developing an Aging Management Program (AMP) that includes rigorous internals inspections. Structural Integrity was involved from the earliest days in this industry effort including beta-testing the guidelines and, in turn, assisting with their formal implementation at several plants. We excel in providing highly capable technical support to plants developing and implementing AMPs to manage the effects of aging on PWR internals. ASME Section VIII governs the requirements for the design, fabrication, testing, inspection, and certification of pressure vessels, while also comprising the design basis for many balance of plant components in a nuclear plant. Structural Integrity has a history of participating in and leading Section VIII activities, as well as supporting projects involving the design, inspection, and certification of replacement Section VIII pressure vessels. This includes providing review and oversight to the fabrication and testing process. Nuclear plants contain numerous heat exchangers, ranging from very large condensers to small coolers; high energy steam generators; safety and non-safety related essential service water coolers; and regenerative moisture separator reheaters. Heat exchangers are degraded by fouling resulting in a loss of heat transfer, cracking resulting in a loss of structural integrity, localized thinning and pinhole leaks, and wear resulting in the need to plug tubes. Structural Integrity’s expertise in the disposition, mitigation, and control of all known degradation mechanisms, as well as in NDE, provides the high-level assistance that the heat exchanger owner needs to maintain the systems and plant reliable and safe. Structural Integrity has supported a southern utility with their programmatic documents in the implementation of MRP-227-A for reactor vessel internals. We supported development of the document as well as addressing requests for additional information from the nuclear regulatory commission. SI also evaluated relevant operating experience from recent MRP-227 examinations to help the utility plan appropriate contingency options. In 2014, a Boiling Water Reactor (BWR) plant identified cracking perpendicular to the heat-affected zone of a core shroud weld, prompting an immediate industry need for guidance on how to analyze these new "off-axis" flaws. Structural Integrity worked with EPRI and outside labs to perform crack morphology and chemistry determination to characterize this first-of-a-kind cracking. We used our extensive BWR experience to also help develop interim NDE guidelines as well as evaluation methodologies for both structural and leakage integrity. Since 2008, Structural Integrity has helped utilities update acoustic and blowdown loads to address numerous vendor safety communications regarding incorrect calculation of loads by the OEM. We have developed independent methods to calculate these loads that address all relevant safety communications, are consistent with original plant design basis and have been independently benchmarked. To date, experts from Structural Integrity have performed updated load calculations for 16 BWR units. A strainer backwash valve was found to be leaking and degraded and a PWR. Structural Integrity was asked to perform a past operability on the valve body to show that it would have met its safety function in the degraded condition. We then developed a detailed finite element model that included the degradation and performed a limit load analysis on the structure, demonstrating that the structure met the required criteria to justify the past operability. The greater the risk, the more rigorous the review — and Structural Integrity dives deep to ensure the integrity of nuclear facilities. From Department of Energy sites to commercial nuclear and weapons facilities, we are sought after for our exacting evaluations. Our structural expertise includes impacts of extreme events, as well as normal loadings over long periods of time. Our in-depth seismic evaluations even allow us to quantify component-level fragilities. Partner with us and tap into the power of prevention. Structural Integrity has in-depth knowledge and experience in designing nuclear facilities, equipment, and piping to natural phenomena hazards. SI’s expertise includes SPRA’s, tornado wind borne missile analysis, seismic time history analysis, infrastructure response spectra generation, soil-structure-interaction, soil fragility, and much more. Our services include seismic qualification of structures, systems, and components both analytically and through shake table testing (TRU Compliance). In addition to seismic, our evaluations have included random vibrations, g-forces, environmental loading, acoustical loading, pressure, and high frequency loadings such as shock, blast, and impact. Structural Integrity is well known for our capabilities in evaluating nuclear facilities and structures for aircraft impact. SI has also evaluated the consequential effects of the high frequency impact to other critical equipment and components by modeling the shock propagation, providing shock isolation systems, and aircraft fuel dispersion fire hazard as a result of the impact. Structural Integrity utilizes the highest powered analytical software to evaluate every kind of missile and impact scenario including vehicles, tornado borne missiles, aircraft impacts, and load drops. Structural Integrity performed a probabilistic analysis to determine time-dependent prestress losses after 60 years for a concrete nuclear containment structure for SNPI. The loss estimates were calculated using an ABAQUS finite element model of the structure to ensure sufficient structural capacity during extreme loading events is specified as a Mission Critical I structure, therefore must satisfy the requirements of Appendix E of UF 3-310-04. The objective of this work is to assess the structural performance of reinforced concrete support structures and bioshields at operating PWR plants based on the data developed for distribution levels of neutron fluence and the effects of this irradiation on the properties of the concrete. Structural Integrity utilized its in-house non-linear concrete analysis code ANACAP to evaluate the long-term irradiation effects up to 80 years of services life. Structural Integrity was able to accurately predict the extent of the damage caused by this exposure through analytical means and ANACAP. Structural Integrity performed an extensive study on the modal combination of hydrodynamic loading in liquid storage tanks. The study analyzed 6 different tanks with varying dynamic properties for all possible ground motions combinations. The study also considered problems addressing the Defense Nuclear Facilities Safety Board (DNFSB) comments related to the influence of fault-normal velocity pulse-like motions. Structural Integrity developed a finite element analysis (FEA) model to investigate local damage effects from an aircraft engine missile impacting a reinforced concrete wall. SI utilized ABAQUS for geometry and mesh generation and TeraGrande (in-house FEA program) for analysis. The FEA model was used to investigate perforation and scabbing of the concrete wall for realizations outside the bounds of available empirical equations. Structural Integrity brings a broad perspective and first-hand knowledge of the industry's best practices in fuel design, analysis, operation, performance, spent fuel storage, and spent fuel transportation. Our fuels engineers have high-level knowledge and expertise in fuel behavior modeling during normal and accident conditions, as well as specialized knowledge in core neutronics, core thermal-hydraulics, design basis accident transients, and radiological dose assessment analyses. Our fuels team specializes in fuel licensing and fuel vendor transition projects, including performance of calculations and preparation of submittals to the US Nuclear Regulatory Commission. Our familiarity with fuel design, manufacturing, and licensing issues enables us to design and develop comprehensive and effective projects that focus on client specific requirements and concerns. This breadth and depth of our expertise, unparalleled in the nuclear industry, uniquely qualifies us to assist our clients in all aspects of the nuclear fuel cycle from fabrication and operation through spent fuel storage and transportation. Traditionally, core design has been the exclusive area of expertise of fuel vendors. However, Structural Integrity provides an independent alternative to utilities to ensure optimized fuel utilization, operational flexibility, and enhanced long-term (multi-cycle) performance. We perform all aspects of reload safety analysis including core neutronics, core thermal-hydraulics, design basis transients, and radiological dose assessment, and we assemble and support licensing submittals that increase operating margins and support power uprates. We have also supported clients with the analysis and licensing of multiple fuel vendors and mixed cores that stimulate competition and, in turn, lower fuel costs for our clients. Structural Integrity has developed and contributed to codes for cutting edge fuel performance analysis for over 40 years; with sponsorship from research and government organizations including EPRI and the US DOE. The evolution of these codes and the resultant modeling advancements, in conjunction with the improved operational guidance we have developed, has led to mitigation of fuel rod failures from pellet clad interaction (PCI), crud-induced localized corrosion, and other damage mechanisms. We have pioneered the use of advanced thermo-mechanical modeling techniques for codes including FREY, DEFECT, BISON, and Falcon. Our team is currently working on a proprietary 3D, finite element-based computational tool for fuel performance analysis. Structural Integrity was the primary contractor to EPRI for the development of the Fuel Reliability Guidelines for use by utilities as well as industry oversight organizations. Our in-depth understanding of these guidelines, together with our advanced computational tools and methodologies, strongly position us to evaluate and mitigate fuel failures due to pellet clad interaction (PCI) and grid-to-rod fretting. Based on this extensive experience, we also provide training seminars to utility staff to enhance their awareness and understanding of these failure mechanisms and the methods and practices available to mitigate them. Structural Integrity’s experience with spent fuel started in the early 1990s, providing support to a well-known Sandia National Laboratory study on cask containment requirements (SAND90-2046), and it continues to this day. Activities supported over this time range from research related to high burnup fuel issues, where we developed and defended methods to quantify cladding integrity during cask drop accidents, to dry cask storage loading patterns, heat load analyses, and radiological dose calculations. SI engineers have supported licensees with new and spent fuel inspections, and fuel manufacturing audits. Structural Integrity has been a contributing developer to the Department of Energy (DOE) Nuclear Energy Advanced Modeling and Simulation (NEAMS) and Consortium for Advanced Simulation of Light Water Reactors (CASL) fuel performance code development programs since 2012. As part of these programs, the Nuclear Fuel Technology group provides critical expertise for the development and testing of 3D, finite element-based computational tools and technology. This work is a vital component in advancing the state-of-the-art in advanced nuclear fuel performance modeling. Structural Integrity provided Arizona Public Service with project management and engineering services to support licensing a second fuel vendor for the Palo Verde Nuclear Generating Station. In addition to partnering with APS to develop and execute methodology to perform both mixed and full core reload analyses, the project team coordinated the support effort from the current and alternate fuel vendors. In so doing, Structural Integrity was able to support APS security of fuel supply needs facilitated by the availability of multiple reliable fuel designs, multiple fuel vendors, geographically diverse fuel manufacturing and commercial competition. Structural Integrity assists in the design, development, operation, and assessment of water chemistry systems for nuclear plants and other industrial water processes. Our chemistry and materials staff are knowledgeable and experienced in full-scale applications of chemical control programs, and processes such as ion exchange, filtration, membrane systems, chemical treatment, clarification and sedimentation, and deaeration. The key to effective chemistry control programs is a clear structure. The programs define objectives, distinguish between the essential and the desirable, identify required resources, recognize human factors, and establish schedules and accountability. Structural Integrity strives for excellence in communication, recognizing that concise exchange of ideas, data, results, conclusions, and recommendations are essential. Whether formal gap assessments versus industry standard or best practices, or preparatory support of INPO assessments, Structural Integrity has the breadth and depth to support. Systems assessed as part of program reviews include condensate polishing, closed cooling water systems, stator liquid cooling, radwaste processing, makeup water treatment, and reactor water clean-up. Our assessments can and have included root cause investigations of anomalies, as well as review of laboratory test methods and conduct of independent testing. Over our history, we have been intimately involved in the optimization of hydrogen and noble metal chemistry programs and processes. Structural Integrity has developed hydraulic models to analyze a variety of systems important to nuclear power plant performance. These models have been used to evaluate the causes of system performance issues, to assess changes for performance improvement, and to assess the impacts of flow and temperature increases that occur from changes including power uprates. Models are both steady-state and non-steady state with examples that include piping network analysis based on 3-D CAD models, top and bottom tubesheet filter backwash, and flow distribution. Piping networks analyzed include condensate systems (deep bed demineralizers, filtration, and filter demineralizers) and reactor water cleanup systems. Ion exchange is a widely used water purification process to control power plant water quality. Structural Integrity develops and applies models for new demineralizer system designs and to evaluate the performance of existing systems. Our experience applies to both deep bed and filter demineralizers and applies to systems from condensate polishing to reactor water cleanup, including the impact from planned power uprates. EPRI’s BWRVIA modeling is a Windows® based PC code that performs radiolysis and electro-chemical potential (ECP) calculations for specified regions in a BWR reactor vessel. Because sampling and ECP measurements in all regions would be difficult and costly, analytical modeling is the best approach. The model can guide engineering and chemistry personnel with hydrogen injection operational strategies for IGSCC mitigation in regions of concern. Structural Integrity’s involvement started with beta testing the software, and progressed to performing analyses, developing reports and recommendations, and delivering training to numerous plants and utilities. Structural Integrity chemistry is a full-service integrator of automation and process control systems with extensive experience in the power industry. Our experience using various automation hardware and software platforms including GE-IP, AB/Rockwell, Modicon, or Siemens. Whether the process control system is needed for a new plant process or as an upgrade to an existing plant system, we will modify each to the plant’s specific needs and design. We employ a multi-step process to ensure the specified process control system is delivered on-time and within budget. Power plants are built from a variety of materials, including metals polymers and concrete. From procurement, through service, repair/replacement, to the end of service, the materials used in the plant are vital to successful operation. At the root of every failure is one or more cause and Structural Integrity offers a complete range of root-cause and metallurgical failure analyses, varying in complexity from one or two specialists to a multi-discipline team performing a full-scope investigation. Welding is vital to the construction, maintenance, and repair of power plants. Structural Integrity led the development and evaluation of the first weld overlay (WOL) repairs for piping. Structural Integrity designed for the client IFDs to be installed in both condensate and RWCU system in all three units following a power uprate. The IFDs distribute flow within the bottom tubesheet Filter Demineralizers (F/Ds) more evenly, promoting flow uniformity along the entire septum length, resulting in more uniform precoats and improved resin utilization. The station observed improved run times on condensate F/Ds immediately following installation of the IFDs. Structural Integrity designed and provided to the client a modern programmable logic controller (PLC) based control panel to replace and upgrade from the station's old electro-mechanical control panel. The integrated control system included both a PLC and Human Machine Interface (HMI) that enabled the operators to perform RWCU operations with direct control and visual feedback for more effective precoat operations and lower dose than had been performed previously. Structural Integrity's patented technology that provides a reliable, inexpensive, passive method of injecting platinum chemicals to maintain proper reactor vessel internals mitigation and inspection relief. This passive injection system has a wide range of injection flow capability, high dilution flow and is designed for minimal operator or maintenance intervention supporting the Delivering the Nuclear Promise initiative. CNMI is a proactive and versatile approach that will eliminate needed existing platinum injection skid upgrades further reducing future O&M costs and extensive labor requirements. Structural Integrity designed biofilm growth detection system that monitors the effectiveness of a biocide treatment program to ensure sufficient application of biocide for system health. The BIoGEORGETM BG4 controller provides a measurement that sufficient biocide is added to prevent micro-biological growth and provides real time monitoring instead of only relying on periodic effluent concentration results. In optimizing the biocide treatment approach, the client will save on operating costs while also reducing the environmental impact on the surrounding area. Structural Integrity provides comprehensive turbine and generator inspection and life assessment services for solid rotors, rotor bores, shrunk on disks, blade attachment dovetails, turbine blades, turbine main inlet sleeves and nozzle chambers, turbine and valve casings, generator rotor dovetails, retaining rings, coupling keyways, and other critical components. Our life assessment analytical services include EPRI®-licensed SAFER-PC© rotor analysis, EPRI LPRimLife© rotor disk rim dovetail analysis, EPRI RRingLife© generator retaining ring analysis, and finite-element stress analysis of shafts, turbine disks, blades, and other components. In the case of turbine failures, our metallurgical testing laboratory also offers a full range of testing services for rotor, disk, and blade failure analyses. Our team brings an in-depth understanding of the complexities associated with turbine and generator operation and familiarity with industry issues, including known flaw locations and orientation in similar machines. This insight and experience leads to targeted inspections that maximize resources and minimize outage times. Structural Integrity’s Turbine/Generator Group consists of industry-experienced engineers and technical staff that have developed and implemented numerous methodologies for evaluating the current condition of many types of generating equipment. Whether the issue is rotor bore condition, solid rotor assessment, blade attachments, inspection of keyways, dovetails, or other geometric features, nozzles, sleeves, rings, or any other critical component in a turbine-generator assembly, Structural Integrity can apply state-of-the-art inspection and analytical methods to provide accurate results. This allows for re-inspection recommendations that are made with confidence and prolong asset life. Based on industry experience, and the ability to rely on seasoned engineering staff and metallurgists from across our organization, Structural Integrity has the capability to perform advanced analytical and inspection activities to accurately answer our clients’ questions regarding their valuable turbine and generator systems. Our life assessment services include use of EPRI® and general purpose finite element software. EPRI® software used includes SAFER-PC©, LPRimLife©, and EPRI RRingLife©. Remaining life assessments of critical turbine and generator components are typically based on deterministic or probabilistic analyses, using conservative (worst case) material property data extracted from public domain databases. When those analyses don’t meet the owner’s operational needs, characterization of material samples from the critical component may provide key information to allow continued operation of units that would otherwise be retired based on database properties. Structural Integrity offers miniature sample removal services to support accurate material property characterization. Because of the impact that even small failures can have on unit operation, consequential damage, repair timelines, and potential for future issues, turbine component failures are critical in terms of causal analysis. Structural Integrity’s metallurgists and engineers have extensive experience in evaluating the damage mechanisms and causes of turbine component failures. SI has the resources to apply a multidisciplinary approach to failure investigation, wherein technical staff in SI’s Material Science Center collaborates with analytical engineers, turbine specialists, and plant engineers to answer tough questions surrounding turbine failures and identify appropriate corrective actions. Vibration monitoring is critical in power generation applications where vibrations can damage equipment, resulting in significant downtime and loss of revenue. It is particularly helpful to analyze turbine vibration data in greater detail during major events like startups and shutdowns, or before and after maintenance activities. Our experts can dive deeply into existing data and recommend additional instrumentation and diagnostics when needed. To monitor the potential for torsional fatigue damage on turbine generator shafts, we developed a product called Transient Torsional Vibration Monitoring System (TTVMS) to measure and record transient torsional events for subsequent analysis of shaft torsional fatigue life. A 1950s vintage steam turbine that had served in a coal-fired unit had been repowered to run as a combined cycle unit. After 10 years of extreme service for the combined cycle unit, however, the OEM recommended replacement. The owner wanted an independent assessment to determine remaining life and engaged Structural Integrity. We assisted in identifying critical components to be assessed which included turbine piping welds, crossover piping, throttle valves and governor valves, HP and LP casings, and HP and LP rotors (including rotor bores, rotor periphery and blade attachments). A 1970's vintage Generator rotor was boresonic inspected by the OEM, after which the OEM recommended a bottlebore of a portion of the rotor bore, to remove indications that the OEM determined were life-limiting for continued operation of the rotor. Due to the cost involved, the owner wanted Structural Integrity's opinion. SI re-inspected and gathered material samples from the bore then performed an analysis of the rotor using the EPRI SAFER-PC code. SI's analysis indicated the rotor could continue to operate without a bottlebore and the owner was provided with a suitable re-inspection interval. Structural Integrity was originally founded in 1983 to help utilities build and operate nuclear plants safely with a focus on the prevention and control of failures. Our support for engineering programs is well-aligned with that initial focus and that's been a growing part of our business. Our staff of subject matter experts can support engineering programs with our wide breadth of technical expertise, our understanding of plant systems, and our knowledge of industry operating experience. Structural Integrity's involvement in ASME Code activities and other industry and EPRI® forums allows for a full understanding of regulatory issues and industry best practices to ensure successful engineering program implementation. Our engineering programs expertise addresses plant and fleet-wide applications of programs for fatigue management, buried piping, service water systems, risk-informed ISI, vessel internals (both BWRs and PWRs), repair/replacement, 10CFR50.69, cast-austenitic materials, welding programs, and others. Planning and executing buried piping inspections is a costly endeavor but utilizing a relational GIS system decreases planning time, allows for additional opportunistic inspection planning, reduction in the number of examination locations, and integrates multiple programs to maximize data interactions. Program turnover challenges are minimized with MAPPro due to the program housing Design, Operational, Historical, Consequential, Inspections and many more variables associated with all system assets, giving engineers a valuable toolbox with everyday use/applicability. A utility experienced repeat degradation of a safety injection line, culminating in a through-wall leak of newly installed Class-1 piping in less than 36 months. Structural Integrity implemented an instrumentation system to monitor OD temperatures during operation. The resulting data conclusively determined the failure cause as thermal fatigue, due to an extreme temperature profile not predicted within existing guidance documents. We assisted the utility with mechanical and instrumentation modifications to facilitate detection and mitigation of future events. Generator (EDG). The tube sample had been removed from the EDG lube oil system as a result of a leak that was identified at a tube support/clamp. Structural Integrity performed a metallurgical and dimensional analyses to obtain information in support of an ongoing investigation as to the cause of failure and the impact on operability of the EDG. Our evaluation confirmed that the cause of the leak was due to uneven wear at a tube clamp and established that the damage mechanism would not impair the EDG from performing its required functions. We also developed recommendations to preclude a recurrence of leaks. Structural Integrity assisted a small modular reactor (SMR) developer with assessing vibration test data obtained from prototypical representations of vessel internal components. Si's evaluations were used to support validation of design analyses and responses to regulatory inquiries. Examinations of safety related piping often reveal localized thinning requiring disposition. Structural Integrity has supported numerous utilities with finite element analyses to qualify piping for continued operation by demonstrating that the stress limits of the system Code of Construction are maintained. Localized thinning that is below tmin can often be shown to have significant remaining life. For example, a utility had 35 locations scheduled for re-examination - using this technique, we were able to show that 6 locations required exam as-scheduled, 6 locations could be deferred between 1 and 5 years, and 23 locations could be deferred more than 5 years. During testing of one of the station emergency diesel generators (EDG), the EDG experienced high jacket cooling temperature, which caused the EDG to be shut down in accordance with station procedures. Structural Integrity participated on the root cause team and successfully identified the specific failure mechanism of the thermostatic control valve along with providing recommendations to strengthen the risk assessment for addressing the significance of the high temperature on EDG reliability. This allowed the station to establish specific inspection criteria to preclude future failures and to successfully address risk impact under the NRC Significance Determination Process. Structural Integrity has worked with numerous utilities implementing extended power uprate (EPU) programs. For one utility, we performed piping analyses to assess expected changes in vibration responses for all piping with changes in operating conditions. In addition, Structural Integrity performed a systematic review of affected small bore piping (1,200+ lines) to identify and address fatigue-susceptible components. Finally, we provided instrumentation and data analysis support during power ascension to demonstrate acceptable responses for vessel internals and piping. We understand that outages and emergent discoveries are critical times at nuclear power plants. You need knowledgeable, responsive experts who have experience solving problems - deliberately and correctly the first time. Structural Integrity has dedicated outage response teams who are available to assist with emergent issues that arise during a plant outage. Our experts are backed by over 30 years of nuclear power plant experience helping resolve problems that otherwise derail outages. Structural Integrity's value is helping power plant owners save time and money on issues that are difficult to solve and require the responsiveness and expertise that we uniquely provide. Examples of outages and emergent support range from chemistry excursions to fuel failures to repair/replacement designs (with associated relief requests) to third-party reviews of internally or externally generated courses of actions including modifications. Encoded and other NDE data, whether gathered by plant personnel, Structural Integrity or a third-party vendor, can be used by to support engineering disposition of the flaw in accordance with ASME (American Society of Mechanical Engineers) Section XI requirements which, in turn, can be used to support operability evaluations, justifications for continued operation, and relief requests, as required. Structural Integrity is very experienced in dealing with the regulator and their reviews and has a long track record of successfully defending our work to clients' benefit. Structural Integrity provides repair/replacement designs and supporting analyses commensurate with design requirements, as well as licensing documents and regulatory interface support when needed. This support can be planned/long-term or, more often, is provided on an emergent basis when least anticipated or prepared for it. Structural Integrity's 24/7/365 availability in these situations is a key and can be relied upon. Structural Integrity has dedicated outage response teams who are available to assist on emergent issues that arise during a plant outage. Our Experts are backed by over 30 years of nuclear power plant experience, helping resolve problems that otherwise derail outages. Structural Integrity's value is helping power plant owners save time and money on issues that are difficult to solve and require the responsiveness and experience we uniquely deliver. Structural Integrity can quickly deploy situation-appropriate NDE technologies to site, including those that can be coupled with our new LATITUDETM non-mechanized, position-encoding technology, for accurate, initial characterization of flaws that are leaking or for confirmation of third-party examination results for suspected flaws. Especially with Latitude, we can rapidly confirm and characterize flaws. In certain cases, we can also harvest field samples for detailed failure analysis at our Materials Science Center in Austin, Texas. As a safe, efficient, and clean source of electricity, nuclear energy continues to play an important role in meeting our world's growing need for electricity. After a U.S. nuclear reactor has been in operation for 40 years, operating licenses may be renewed for additional 20 years periods. More than 75 plants in the US have already renewed their licenses to 60 years of operation and some owners are now interested in operating their plants for an additional 20 years (an 80-year service life) - a process termed as a second License Renewal or SLR. Structural Integrity can help ensure your plant will meet the demands of a longer operating life and make your journey to license renewal and SLR a smooth one. We have been a key consultant to nearly every U.S. utility that has sought to extend nuclear plant operating licenses to date and remain actively involved with industry efforts coordinated by both EPRI and Nuclear Energy Institute. The range of our License Renewal and SLR services has grown significantly over time and now address nearly every aspect of a License Renewal or SLR project. Having grown alongside the nuclear energy industry, Structural Integrity is a powerful partner through every step of the license renewal process. Today, most operating U.S. nuclear plants have received a renewed operating license from the NRC for a 20-year license extension to 60 years of operation. By 2040, half of the nation's nuclear reactors will have turned 60. As of mid-2018, Turkey Point and Peach Bottom have already submitted a Subsequent License Renewal Application (SLRA) and the Surry and North Anna stations are actively working on their SLRAs. Other plants are also working on plans to submit SLRAs and SI is pleased to be a contributor to the Time Limited Aging Analyses (TLAAs) and aging management programs (AMPs) for every one of these SLRAs. Leaks in your plant's buried piping are a serious concern - and the risks only grow as equipment ages. Structural Integrity's multi-disciplined, turnkey offer for buried piping grew out of NEI 09-14 and is underpinned by our MAPProTM software, a risk quantification and data management/visualization tool, currently being used by over 50% of US nuclear plant sites. Whether your issues are related to cathodic protection, soils, coatings, piping stresses, or one of many forms of corrosion, we can assist. Our engineering and data management services are complemented by an array of inspection and monitoring services leveraging technologies such as guided wave, EMATs, and pulsed eddy current.